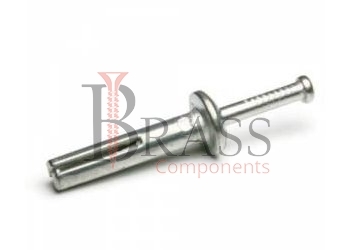 Drive Pin Anchors are made from Carbon Steel, Stainless Steel, Free Cutting Brass, Leaded Brass, 301 Stainless Steel or Aluminium which are passivated and tested to ASTM and other International Standards. Drive Pin Anchors are two pieces of anchors composed to hollow tubular portion to expand the portion of anchor which is driven into tube. The standard range of Drive Pin Anchors are available with Chrome, Zinc, Tin, Electrolytic Tin, Copper, Natural Brass or any type of coating as per custom requirements. They are available in any metric or imperial sizes as per Custom Specification. Available in One piece or two-piece drive pin anchors. Pre-formed, Pre-Expanded Mechanical Drive Pin Anchors. Vibration Resistant Drive Pin Anchors. Drive Pin anchors are internally threaded and containing cylindrical body. Available in variety of configuration, different head styles including flat head, flange head, round head, tamper-proof head and more. Drive Pin Anchors provide Quick and Permanent Anchoring. Drive Pin Anchors provide superior holding power. For used in concrete block, bricks or stone. Drive Pin anchors ideal for wood-to-concrete applications. Drive Pin Anchors used for suspended ceiling application. We manufacture Drive Pin Anchors as per Custom Specification and export in France, Italy, Switzerland, Poland, Greece, UK and other European Countries. For more Information, Please Contact Us or Inquiry Now.